Sally Wisniewski (21) was jogging in a park in Kent when she was attacked by John Fonting (37), who had been stalking her for a year. Fonting was interrupted in his attempts to rip off Wisniewski’s clothes by ‘this massive grey thing that was like a gorilla, but taller and more pointy’. The creature hurled Fonting against a tree, incapacitating him. Suave, sophisticated, erudite and charming, Gig Danvers seems too good to be true. He appears from nowhere and sets about promoting humanitarian causes and revolutionising science, using his growing influence for the good of all humankind; but are the cynics right to be cautious? Is there a darker side to this enigmatic benefactor? 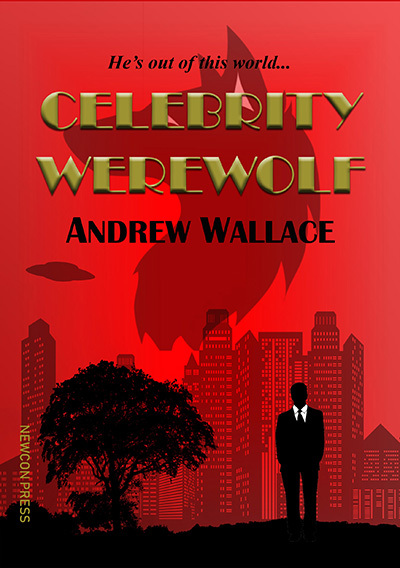 One that is more in keeping with his status as the CELEBRITY WEREWOLF? Andrew Wallace masterfully blends horror with high concept science fiction, in a short novel of first contact that is both moving and funny, yet plumbs the darkness of the human soul. The result is a story of surprises, wonder, and of hope. “Droll, and very funny in places... I enjoyed this a lot.” – Dave Hutchinson, author of Europe At Midnight. Available as an A5 paperback and a special numbered hardback edition, signed by the author and limited to just 50 copies.